Need Power for Your Snowmelt System? Are you looking to install a heated driveway system, but you’re not sure if you have enough amperage to power the system? If you want the performance and reliability of an electric snowmelt system, but can’t find the amps to power the system, Warmzone has the solution that makes it possible to still install that dream snowmelt system. Zoning (or staging) your snowmelt system allows you to minimize the power (amps) needed to run your system. But just how does zoning work? For demonstration purposes, let’s say you only have two 30-amp breakers available to power your heated driveway. The area of the snow melting system is divided into zones, as shown in the corresponding illustration. (See Zones 1-4.) Each zone has its own snow sensor, and the same power source (breakers) is supplied to each zone. The zones are then prioritized. Zone 1 is designated as the most important area which needs to be cleared first. When the sensor in Zone 1 detects snow, it signals the controller to activate the system, heating the area until Zone 1 is clear of snow. After Zone 1 is cleared, the breakers then shift power to Zone 2. Zone 2 then energizes and melts the snow. After Zone 2 is cleared, the breakers shift power to Zone 3, clearing Zone 3 before then powering Zone 4. Two 30-amp breakers power Zone 1. After Zone 1 is clear, the power switches over to Zone 2. When Zone 2 has been cleared, power is sent to Zone 3, and then to Zone 4. Using Warmzone’s cycling system, the entire snowmelt area can be powered by two 30-amp breakers. Warmzone’s industry leading cycling system is the industry leading zoning solution because it utilizes a “smart” feature. For example, if the snow in Zone 3 has melted before the zone is activated, then there is no need for Zone 3 to energize. The sensor in Zone 3 would detect that there is no snow, and therefore not trigger the system to activate. This saves money by operating only when it is needed. Other zoning systems activate by a set time. These systems cycle between zones, regardless if a zone has been cleared of snow or not. So if Zone 1 is partially melted, and the timer switches to Zone 2, neither area will be fully cleared. This creates much longer melt times. Using Warmzone’s cycling system; the priority area will always be melted, thus allowing for real time usage of the heating system. 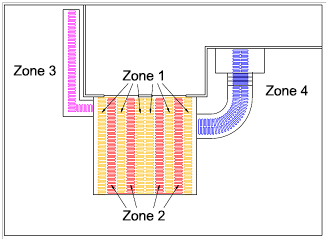 For more information on zoning, contact a radiant heat expert at 888.488.9276. Weather experts at the National Weather Service (NWS) and meteorologists have boldly predicted that there is a 99 percent chance that a massive cold-front will hit the U.S. sooner in the year than has ever happened. According to Dr. Boris Scvediok, a doctor of global weather sciences, the early winter blast is estimated to produce record-breaking snow storms throughout the entire United States. Meteorologists are even warning that many U.S. residents could see up to 50 times the amount of snow compared to years past. Because snowfall is predicted to arrive as soon as early October, the average accumulative snow for the 2014 season is expected to be five to ten times that of normal. In other words, this is the type of winter that Americans need to prepare for. Edward F. Blankenbaker, Senior Administrator of Meteorologists, told the media that this year will likely be a once-in-a-lifetime kind of snowy winter. “Pretty much everyone will see snow like they never have in their lives. Most younger people don’t even know what an actual blizzard looks like, but by the end of March, they will be seasoned survivalists,” Blankenbaker said. Naturally, a radiant snow melting system is an excellent way to get a leg up on Mother Nature, but having a heated driveway and/or walkways is just one part of the solution. Americans will need to minimize their travel plans and make sure that their vehicles have a weather emergency kit. The Northeast, Ohio Valley, and the Midwestern states are expected to get hit the hardest. In addition to the impending severe winter weather, the Food and Drug Administration (FDA) predicts supply and demand could cause shortages, causing the prices of some staples like bread and milk to increase substantially. FDA spokesperson Rebecca Miller suggests alternatives in preparation of the coming months. Public safety organizations are also encouraging consumers to prepare themselves for brutal winter conditions by obtaining the proper necessities. According to James Satterfield from the National Fire and Safety Advisory Board, preparation can save lives. “Don’t wait until temperatures plummet into a freeze; obtain cold weather clothing and footwear, including wool thermal socks. It is also crucial to have plenty of batteries, candles, weather radios, you name it. Get prepared, it’s coming.” Satterfield warned. Trade in your shovel and salt for an easier snow removal solution. Pick up the phone and call Warmzone (888.488.9276) to discuss your plans for stress free winters with a radiant heated driveway.